From the northern tip of Australia to its southern tip in Tasmania, the route covers more than 3800 kilometres. Naturally, when you are moving from Cairns to Hobart, you need to be cautious, particularly if you have items that can get damaged on a long journey. You can put all your worries to an end by hiring Roadways Furniture Removals, the most trusted Australian interstate moving company the best for Cairns to Hobart removalists. We have helped hundreds of clients move their home throughout Australia; we can help you too. You need to pack your things before they can be moved. Skilled furniture removalists from Roadways will reach your house a day before your moving date and pack your household knick-knacks in cartons and moving boxes, and seal them up expertly for transportation. We have t-chest cartons, book and wine cartons, port-a-robes, picture cartons, mattress wraps and lounge covers. Each box will be marked before they are dispatched. We will also help you unpack upon arrival in Perth. With our interstate backloading service, you will be able to save money. Roadways charges you only for the space your goods occupy in a truck. The procedure is almost similar to the method applied by airlines where the same aircraft carries goods for different clients. 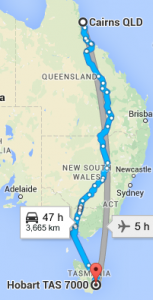 You will be sharing cargo space in the truck/van with other clients bound for Perth. This means reduced hiring and transportation costs as compared to paying for the whole truck or container. Try Roadways Furniture Removals for your Cairns to Hobart removalists. Ask for a quick estimate; we will be happy to offer you our service.